Kingi Kiriona (Ngāti Ruanui, Ngāti Kahungunu, Ngāti Apa) has established himself as a prominent composer, orator and performing artist. Kingi rose to fame while still at secondary school, winning both English and Māori sections of the National Manu Kōrero competition. His prowess in oratory and composition followed through to Tainui Regional and National Kapa Haka competitions, co-founding a new and innovative team, Te Iti Kahurangi in 2003. E Te Pouaka Whakaata Māori! ​ Ka ngau ki taku puku, a haha! ​ Kua rongo rānei koe? Nau mai e Tāne, oro mai! Tūrou! Ka whakapaparia te uri tūpuna, ko Taitumu tēnā! ​20 E tia, e tia, e tia! E ranga, e ranga, e ranga! Kei Tiritiri-o-te-moana i a haha! ​ Kuikui, whitiwhiti ora, he whenua ipukarea! ​ Whitiwhiti ora, ko Aotearoa - taku ipukarea! From whence originated the great Tai progeny. ​And where the canoe was renamed Ītere, before sailing onwards to Araura. Birthplace of Taitumu, the son of Tainui. Araura, Ūtataki, a beautiful place! ​Paddle in unison oh kin! Forward to Tiritiri-o-te-moana where dwells the greenstone spoken of by Ngahue. Where others of the great fleet also moored. ​Heed the call of the shining cuckoo! Herald of the new homeland, Aotearoa! (Haul our canoe upon its shores). It is life! It is Aotearoa! Te Iti Kahurangi were priviledged in September 2009, to accompany King Tūheitia on his first official state visit to the Cook Islands, to strengthen ties between both countries and their indigenous peoples. During their stay, many stories were shared about the linkages between descendants of the Tainui canoe and the people of Rarotonga. According to Cook Island history, Tainui was instead a man who was born in Tahiti but raised by his grandparents in the traditional homeland of Hawaiiki. As a young man, Tainui yearned to be reunited with his parents and siblings back in Tahiti. And so, his grandfather fashioned him a canoe called Te Kārae-a-Kura, so he could make the journey to his younger siblings; Tai-te-ūkui, Tai-te-nio-veri, Tai-te-rā-varu, and Tai-te-rā-iva. Subsequent to their reunion, Tainui and his family, as well as their descendants, became known as Ngāti Tai. It wasn’t long before Tainui, along with his family, began inquiring about ocean exploration. They embarked on a journey aboard Tainui’s canoe, which they renamed Ītere. They first landed at Araura otherwise known as Aitutaki, an island atoll off the coast of Rarotonga. Here, Tainui married Kura-i-te-rā, the daughter of local chief Rū who discovered Araura. Together, they begat Taitumu. What ensued was a visit by the eponymous ancestor Ngahue, who brought with him stories of the precious greenstone which he had seen in his journeys across Aotearoa. These stories incited such excitement, Tainui and his family once again boarded their canoe to make the Pacific Ocean voyage. It was here that the canoe was given the name Tainui. Upon departing Araura, the Tainui canoe headed for Ngātangiia cove in Rarotonga, where other canoes from Hawaiiki also moored. Its final destination was Aotearoa. Many of the places and landmarks mentioned above were part of the excursions during the group's stay in the Cook Islands. 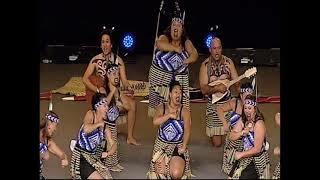 Moreover, some of the tunes and actions of this whakaeke, were influenced by songs and cultural displays they encountered, such as ‘ute’ and ‘pe’e’. This whakaeke serves as both an acknowledgement and a reminder of the group's trip to Rarotonga alongside King Tūheitia, one which they will never forget. An extract of the karakia or incantation performed by Hoturoa, when he launched the Tainui canoe at Pikopiko-i-whiti. Fitting, given this particular section of the whakaeke speaks to the sacred lagoon. Ūtataki is also another name for Aitutaki or Araura. The tune for this part in the whakaeke was adopted from the well known Cook Island classic ‘Kia Orana’. Tuarea was the name of the marae where Tainui and his kin of Ngāti Tai lived on the island of Araura. During our stay, Te Iti Kahurangi was taken to the site, which is a clearing near the water’s edge. There are many accounts which speak of ‘te ika a Ngahue’. To many, it was a greenstone adze. However, in the context of this whakaeke, the term is in reference to the stories of greenstone shared by Ngahue, which brought Tainui and his kin to Aotearoa. 26. Kuikui, whitiwhiti ora, he whenua ipukarea! Words to express the calls of the pīpīwharauroa, or shining cuckoo. Some historical accounts, particularly within Waikato, suggest that as Tainui approached Aotearoa, the pīpīwharauroa was sighted. The people on board regarded this as an omen that land and their new home was near.